Please note this listing is for. Various items with individual prices and. Double check while you make your selection thanks. Goodmans Copper Diamond Sparkle. Kettle, Microwave , Tea, Coffee, Sugar Set. A stylish addition to any kitchen, this Goodmans Toaster, Kettle, microwave boasts a contemporary copper colour and diamond-effect detail. Toasts 2 slices at a time and features defrost, reheat and cancel functions, putting you in total control each morning. Cancel / Reheat / Defrost functions. Goodmans Diamond Copper Kettle 1.7L. Handle has been ergonomically designed to make pouring easier while the overheat protection function prevents unnecessary damage to the kettle element. 1.7 litre capacity. 360° swivel base for right and left handed users. Removable washable limescale filter. Boil dry and overheat protection function. This Goodmans microwave packs in a lot of power, whether you’re cooking or reheating. It hosts a large 20 litre capacity and boasts 700W of power, to reward you with nutritious and delicious food every time. The manual control panel offers a choice of 6 power levels, in addition to a useful auto defrost option. So whether you’re reheating a hot-pot or quickly cooking a pizza, you’ll find exactly the setting you need. Ideal for people with busy lives, this Goodmans microwave is a prudent choice for hassle-free cooking and reheating. Easy to use manual controls. Stylish mirror finish door. Perfect for tea, coffee and sugar storage. Or why not use keep your pasta or rice fresh? 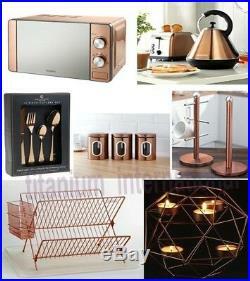 Stylish copper cutlery for the contemporary kitchen. 4 x Dessert Spoons. 4 x Tea Spoons. Stylish folding 2 tier draining rack with additional cutlery basket. Complete with opaque colour plastic draining tray. H22 x W39 x D32cm (8½ x 15¼ x 12½). W43 x D32.5cm (17 x 12¾). Galaxy Tea Light Holder. 19 x 19 x 17cm (7½ x 7½ x 6¾). Tea lights not included. Authentic retro style telephone. Features an original style mechanical bell ringer. Very easy to set up. Push button dialling and also has a re-dial button. 5-Piece Copper Coloured Oval Storage Set. Stylish 5-piece oval storage set with a copper coloured finish. Bread bin – 33.5 x 21 x 27.5cm (13¼ x 8¼ 10¾”) Biscuit tin – 17.5 x 12.5 x 20.5cm (6¾ x 5 x 8″) Tea, coffee, sugar canisters – 14.5 x 10 15.5cm (5¾ x 4 x 6¼) Wipe clean. Care Instructions: Hand Wash Only. Type: Tea Coffee & Sugar. Update your room in an instant. This gorgeous Copper Wall Clock is a real statement piece that is bang on trend. Copper is the colour to have amongst your home decor and this clock will modernise your interior design in an instant. Place it in your office, a bedroom, or even your kitchen – it is versatile enough to fit in anywhere! 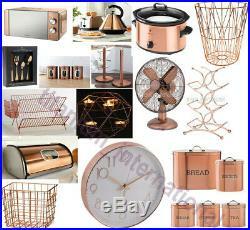 Pair it with other copper items to tie your whole room together for a modern, stylish look. Height: 30.5 cm. Width: 30.5 cm. Goodmans 3.5L Slow Cooker – Copper. This Goodmans 3.5L slow cooker takes away any worries about not having enough time to cook nutritional meals from scratch. You can cook any meat whilst retaining flavour and add vegetables and stock into the same pot before leaving to slow cook whilst you are out for the day. Stainless steel outer shell. Add some style and character to your kitchen with this lovely Square Wire Basket. Available in a choice of three metal colours, you can spice up your food preparation area with some fabulous storage space. Store fruit, bread, and much more in this Wire Basket. Blaupunkt 12 Desk Fan. Perfect for the summer months, this large desk fan is ideal for keeping you cool while working. Adjustable tilting fan head. This Bread Bin With Window is a stylish and practical way of keeping your bread and rolls fresh. Hexa Rose Gold Wire Bin – Rose gold. Quirky hexagonal wire design. Perfect for the living room or bedroom. Part of our NU Living Collection. Finish: Rose gold-effect foil. Material: Bin – Steel wire. Visit our shop for more items. Customer has to pay extra 25 pound for UK highlands & islands and remote location post codes. We are more than happy to solve any genuine issues / manufacturing fault related with our products. Thanks for your time. Also, we take any issues very seriously, so if we have made a mistake, please let us know first. We will respond to you asap. Any item faulty, damaged or unwanted should be informed within 3 days of receipt. Also we will need a picture for the fault or damage. If you have received faulty item i. In all cases it is important to inform us within mentioned time period. Goods are subject to availability. In the event that we are unable to supply the goods, we will inform you of this as soon as possible. If we discover an error in the price of goods you have ordered we will inform you as soon as possible and give you the option of reconfirming your order at the correct price or cancelling it. If we are unable to contact you we will treat the order as cancelled. Changing or cancelling orders. If your order has not yet been dispatched then this will be possible free of charge, however if you have received the order and you wish to change / cancel goods we will apply a charge based upon the direct cost to recover and / or redeliver goods. 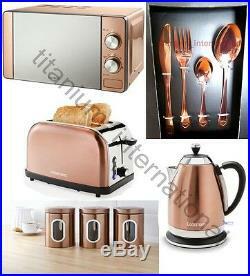 The item “Copper Microwave Kettle Toaster Cutlery Set Canister Cooker Pan Fan Bin Mug Tree” is in sale since Friday, April 7, 2017. This item is in the category “Home, Furniture & DIY\Cookware, Dining & Bar\Food Preparation & Tools\Cooking Utensils”. The seller is “titanium_international” and is located in london, London. This item can be shipped to United Kingdom.